Come and join us at our pre-school sessions that let your little ones get in touch with nature, as we explore Brockholes and get stuck into some fun outdoor activities! Each session has a different theme and activities include nature art, story time, bug hunts, games, crafts and much more! We run Nature Tots sessions every Friday (9.30am - 10.45am) during Lancashire School Term time. Nature Tots is suitable for ages 15 months – 5 years. Please come dressed for the weather wearing sturdy footwear as Nature Tots takes place outdoors. Children must be accompanied by an adult (free of charge). 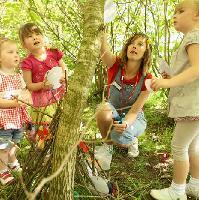 Nature Tots at Brockholes has kindly received generous funding following the closure of Offsprings Nursery. As of September 2018, we are now able to offer discounted tickets for Nature Tots. The cost of each Nature Tots session is now £4 including car parking. Car registrations must be given to our Nature Tots staff/volunteers on arrival to each Nature Tots session to receive free car parking. Advanced online tickets go off sale at 11.45pm the day before the event. On the day tickets (subject to availability) are £6.00 per child.